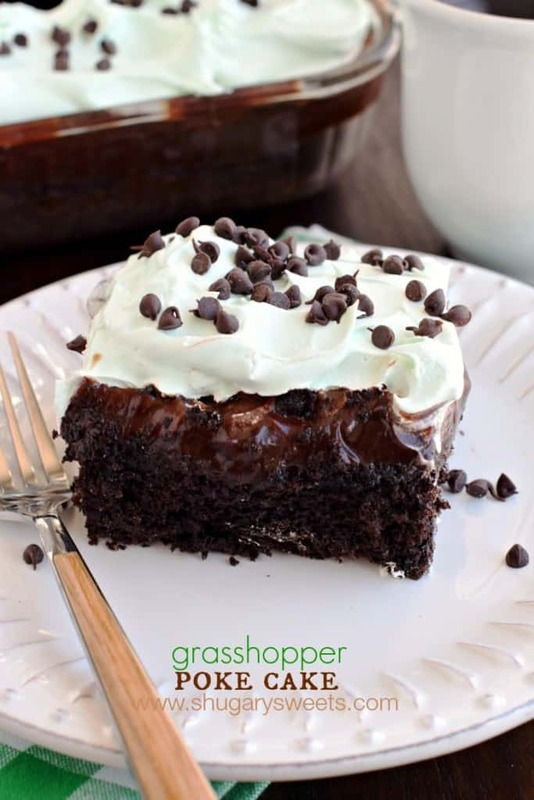 This Grasshopper Poke Cake is super easy and over the top delicious. 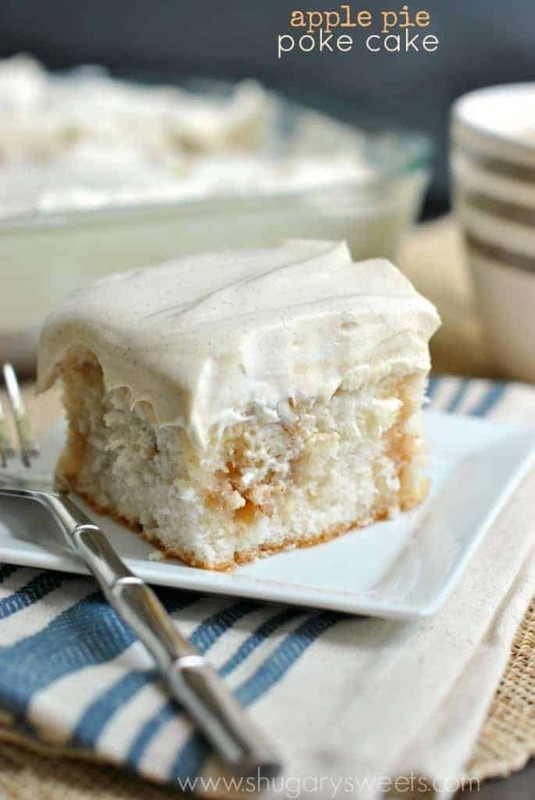 Just a few ingredients and boxed cake mix and you’ll be enjoying this for dessert today! I fail at pot lucks. And by fail I mean…I bring things that are half eaten. It’s so wrong, but it’s one of the downsides to being a food blogger! Ha. Last week, my family was all getting together, and I was in charge of bringing the dessert. 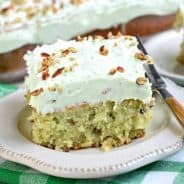 I knew I wanted to make a Grasshopper Poke Cake. I’m obsessed with poke cake recipes, and chocolate mint just seemed like the perfect answer for this time of year! Of course it turned out lovely and I had to get a photo before I left my house. You may have seen it on Instagram? I did show up with this cake, with a big slice missing. Fortunately my family is pretty forgiving and were just happy to enjoy some delicious cake. I really should learn to bring tried and true recipes to family functions and not try to test out a new one. But isn’t that the fun of being a food blogger? Trying new recipes out on friends and family? UGH, the struggles I tell you. It’s a rough job. I mean seriously…sometimes I have to bake two or three cakes just to get it perfect. I’m kidding, it’s not rough. It’s just cake. And I’m pretty sure everyone loves cake, right? Creme de Menthe baking chips. I then mixed up some instant chocolate pudding mix and milk. When the cake came out of the oven, I immediately poked holes all over the top (I use a wooden skewer). Then pour the pudding all over the cake, spreading gently so it falls into the holes. Top the pudding with a jar of hot fudge sauce. Oh yeah. Finally, I mixed up a big tub of Cool whip with a drop of green food coloring and half a teaspoon of mint extract. Spread over the cake, sprinkle with mini chocolate chips and refrigerate for at least 4 hours (or overnight). Heck yes, this will be a big hit at dessert! 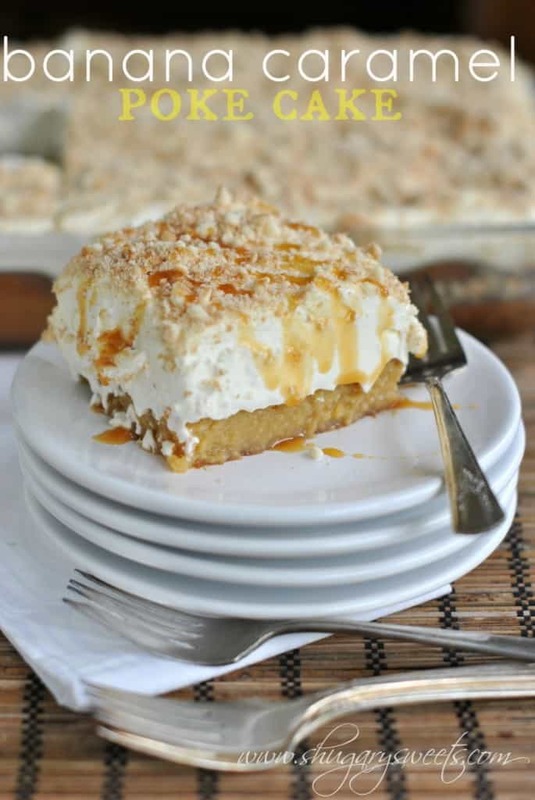 Apple Pie Poke Cake: I crave this beauty all year long! So easy and is loved by all. 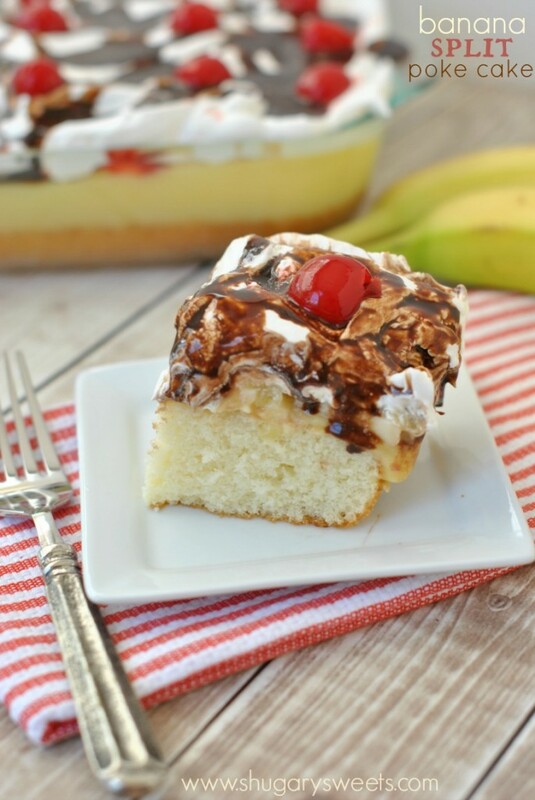 Banana Split Poke Cake: so many delicious flavors in one easy cake! 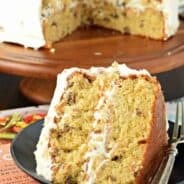 Banana Caramel Poke Cake: this dense, rich cake has an incredibly different flavor and texture than most. So good! Bake chocolate cake according to package directions for a 13x9 cake. Before baking though, fold in the Andes baking chips! In a small bowl, whisk together the pudding mix with milk. Remove cake from oven and poke holes over the top immediately. I use a wooden skewer for this. Pour the pudding mix over cake while warm (no need to let pudding set). Spread hot fudge sauce over the top of the cake. Some of the pudding and hot fudge will settle into the holes of the cake, it's a good thing! In a large bowl, fold the Cool Whip with mint extract and a drop of green food coloring. Spread over cake and sprinkle with mini chocolate chips. Refrigerate cake for 4 hours or overnight. Slice and serve! I’m loving all of these mint recipes for St. Patty’s Day! This looks delicious. The pudding adds a great touch to an already delicious-looking dessert. Ohhhhhhh goodness gracious! This needs to GET IN MY BELLY ASAP!!!!!!! I like anything with the word Poke in it as long as it’s not a Facebook poke. (I mean what are those anyhow). Mint desserts are the best! They just settle your stomach after a nice, big dinner. Looks so easy too. My family has to deal with me and my ridiculous half-eaten desserts too. They’re pretty forgiving once they get to dig in themselves, though! This looks amazing! I don’t think I’ve ever had a grasshopper pie before. For shame. Haha everyone is so used to a slice missing from me! No one even bats an eye anymore. I love this cake, obvi. Mint, chocolate. TO DIE FOR! Whoa. This looks so ooey gooey and awesome!! Oh my gosh, I NEEEEED this cake!! Totally love it. THIS IS SO FUDGY. BRB, dying. PS – I love all your poke cakes so much! This looks amazing. I love poke cakes. Such a weakness of mine. This looks like a true indulgence! Loving all the layers! Pinned! I’m loving all the layers, Aimee! The pudding, the hot fudge, the cool whip, and most importantly the cake! I need to make a poke cake soon and it must be this one. Pinning! This looks great! My son would go nuts over this – he is so into everything Mint!!! This cake looks out of this world amazing! And testing out recipes on family is the best part – they sing your praises if it’s awesome and there’s less for you too eat/throw away if it comes out terrible, ha! You knocked this poke cake out of the park, Aimee – love all those amazing layers! I totally understand your family’s frustration! My family gets mad when I make a treat and they can’t eat it until I am done taking pictures of it which is sometimes a couple days later! Haha at least they get some 😉 This cake looks delicious! I just made a red velvet poke cake this weekend but this has fudge?!?! YUM! I always have to taste what I bring to gatherings and sometimes that “taste” can be a slice – just to be sure it’s good. You can’t go wrong with a poke cake and that mint and chocolate combo is the best. I can’t handle the goooey delicious decadence of this cake!!! Wow, this is one mouthwatering creation! I am in love with chocolate and mint, and I would eat this cake happily, with or without a missing piece! This cake sounds delicious and you added a whole jar of hot fudge. Yes please!! I am always torn at work potlucks if I want to blog about something I make. To precut and photograph before or after. After never seems to work! That’s kind of my way of playing with fire, Aimee. I tell people I’ll bring the dessert for a potluck, invent something, and cross my fingers and hope for the best. It’s kind of nerve-wracking, but also a total high when it works out great. This is definitely one of those big successes. I love it! I know. I live on the edge, haha!!! Everyone around me is so used to the missing slice or hacked at dessert that I show up with. And yes, more cake is always a good thing! 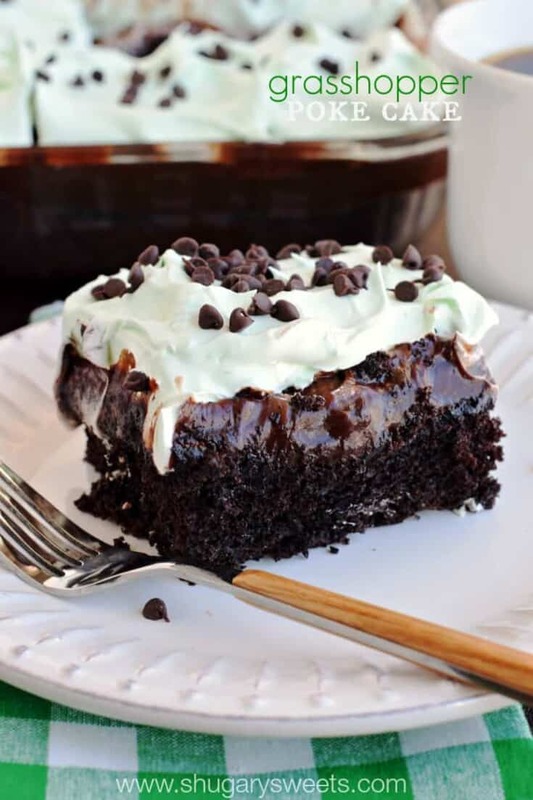 Love this fun chocolate mint pudding cake!!! I totally know what you mean about always testing new recipes out on your friends and family! I thought I was the only one that did that haha! This cake looks amazing!! Pinning! Oh wow Aimee! Chocolate + Mint = Heaven! This looks amazing… I love poke cakes and I can’t wait to try this. I could eat this entire cake! Not even kidding. 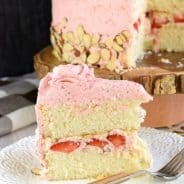 I like how easy it is to make and it’s the perfect cake to bring to family and friends! I’m the queen of showing up with dessert that has a serving or two missing… It’s why I almost always pre-slice my cakes! That way, I can arrange all of the slices on a plate, and nobody notices the missing two. (Until they check out the blog or Instagram… 😉 ) And I totally wish I could be adopted because that cake + pudding mix combo is calling my name way too loudly! Pinned! Pre sliced cakes? What a genius idea 🙂 Thanks for pinning! 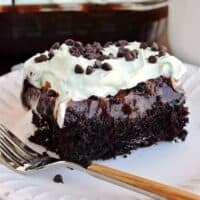 I will say that out of all the poke cake, I am partial to mint chocolate! I made this for my husband’s st. patrick’s day birthday! He brought it to work to celebrate with everyone and I can’t wait to hear how it all turned out! Thanks for sharing your recipe!! My child asked for chocolate sheet cake so I had the idea to just do cake with hot fudge and cool whip but then I did a Google search and came across your blog. Now I’m curious what does the chocolate pudding do to the cake?!? I was just gonna throw together what I was thinking but then saw this and thought I might should try it. Do you wait until the cake has cooled before topping it with the cool whip? Made this tonight for my moms 70th tomorrow. She loooooves chocolate. I’m torn whether to top w coolwhip as your recipe calls or should I top w whipped chocolate frosting?? Too much chocolate that way?? Let me know your thoughts if you get this! Thanks! Does this need the be stored in the fridge? Do you heat the fudge sauce first or use cold from the jar? Making this now, so not sure if you’ll see in time. Thanks!